Grasmere is one of the prettiest villages in the Lake District. Even without its substantial connections with the poet William Wordsworth it would still be one of the most visited places in the area. It lies by the River Rothay in an amphitheatre-like setting, overlooked by the rocky fell of Helm Crag, more commonly known as The Lion and the Lamb, and surrounded by lush meadows. Most of the buildings date from the 19th century but some, such as St Oswald’s Church, are much older. The roads and thoroughfares in the village are lined with trees, giving the village the appearance of a woodland settlement. Grasmere takes its name from the lake just south of the village. Measuring just one mile long and half a mile wide it’s not one of the biggest lakes in the Lake District, but is certainly one of the most scenic. It’s fed and drained by the River Rothay which then continues east into Rydal Water. The main tourist attraction in the centre of the village is St Oswald’s Church. The churchyard here is home to the graves of William Wordsworth, his wife Mary, his sister Dorothy, and other members of his family. The Grasmere Gingerbread Shop is at the entrance to the churchyard and sells the world famous spicy gingerbread, first made by Sarah Nelson in the mid-19th century. The small building was once the village school where Wordsworth briefly taught. Wordsworth lived in several houses in and around Grasmere. In 1799, after spending a short time in Germany, Wordsworth and his sister moved into Dove Cottage, ¼ mile south east of the village, and it was here where he wrote much of his best poetry. Guided tours of the house are now offered. The adjacent Wordsworth Museum houses a unique collection of manuscripts, books and paintings relating to the poet. Wordsworth married in 1802 and Dove Cottage soon became inadequate for his growing family. In 1808 he moved to Allan Bank, a large house just west of the village, and in 1811 to the Old Rectory, opposite St Oswald’s Church. Although both buildings are now owned by the National Trust, they are rented to private tenants and not open to the general public. Following the death of his two youngest children in 1812, Wordsworth could no longer live at the Old Rectory and in 1813 moved to Rydal Mount, a large house overlooking Rydal Water. He lived here until his death in 1850. Wordsworth only ever rented the house but in 1969 it was purchased by his great great granddaughter. It has been open to the public since 1970. Popular walks from Grasmere include the relaxing circuit around Grasmere (lake) and Rydal Water, the climb up Helm Crag, and easy stroll up to Easedale Tarn. Grasmere is a popular tourist spot and offers a reasonable selection of hotels and places to stay. There are no campsites or caravan park near the centre of Grasmere village. The closest options include the campsite at Rydal Hall (2 ½ miles by road), Baysbrown Farm Campsite (4½ miles), and Skelwith Fold Caravan Park (6 miles). Grasmere lies just off the A591, the road linking Keswick to Windermere and Bowness. Visitors travelling from the north should leave the M6 motorway at Junction 40 (Penrith) and head west on the A66 (signposted for Keswick). After driving for 12 miles take the B5322 and follow the road for 4 miles until it joins the A591 (near Thirlmere) and then drive 8 miles south to Grasmere. Those travelling from the south should leave the M6 at Junction 36 and take the A590 / A591 directly to Grasmere. Parking in Grasmere can be an absolute nightmare, especially in the summer. The Lake District National Park Authority operates two car parks in Grasmere. The car park on Stock Lane (postcode LA22 9SJ) is the most central and is close to all the major attractions (St Oswald’s Church and William Wordsworth’s grave, Grasmere Gingerbread Shop etc.). The other, Broadgate Meadow Car Park, is situated at the northern end of the village, just of Broadgate (postcode LA22 9TA). There’s also a car park on Red Bank Road, to the south west of the village (postcode LA22 9PU). It’s run by South Lakeland District Council and offers 79 spaces. The 555/556 service between Lancaster and Keswick stops at Bolton-le-Sands, Carnforth, Kendal, Staveley, Windermere train station, the Lake District Visitor Centre at Brockhole, Ambleside, Rydal, Grasmere, and Keswick bus station. The 599 service runs between Grasmere and Bowness, calling at Dove Cottage, Rydal, Ambleside, Waterhead (for Windermere Lake Cruises), the Lake District Visitor Centre at Brockhole, and Troutbeck Bridge. On Saturdays in the summer the X8 bus from Chorley to Keswick stops at Preston, Windermere train station, Ambleside, and Grasmere. The nearest railway station to Grasmere is Windermere train station (8 miles by road). Visitors arriving here can catch the 555/556 bus to Grasmere. 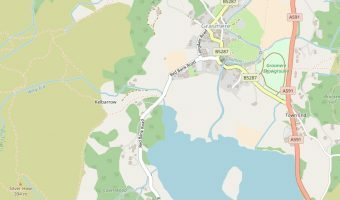 Interactive map of Grasmere. Shows hotels and tourist attractions.